Hot, tropical climate at sea level, cooling towards the highlands which also cause climatic variation from one area to another, affecting the southeast trade winds and the northwest monsoons. The majority of the rain falls between December and March due to the northwest monsoon, although Port Moresby enjoys a dry season at this time. There is frost and there are occasional snow falls on the highest mountain peaks. 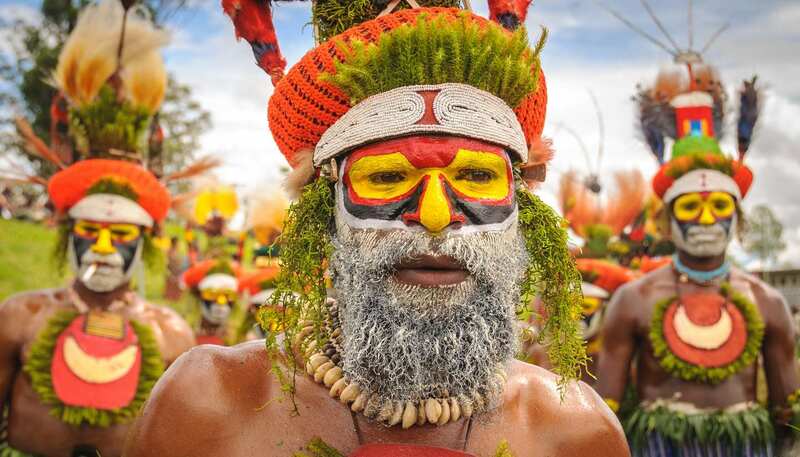 Papua New Guinea consists of over 600 islands and lies in the middle of the long chain of islands stretching from mainland South-East Asia. It lies in the South Pacific, 160km (100 miles) north of Australia. The country occupies the eastern half of the second-largest non-continental island in the world, as well as the smaller islands of the Bismarck Archipelago (Admiralty Island, Bougainville, New Britain and New Ireland), the D'Entrecasteaux Island group and the three islands of the Louisiade Archipelago. The main island shares a land border with Irian Jaya, a province of Indonesia. The mainland and larger islands are mountainous and rugged, divided by large fertile upland valleys. Fast-flowing rivers from the highlands descend to the coastal plains. A line of active volcanoes stretches along the north coast of the mainland and continues on the island of New Britain. To the north and south of this central mountain range on the main island lie vast stretches of mangrove swamps and coastal river deltas.